Our tour guide will pick you up at Beijing airport, holding your name board at the exit, then you will be transferred to hotel. The rest of the day is free time. In the morning, visit the historic Tiananmen Square and the majestic imperial palace Forbidden City nearby. Soak in the Temple of Heaven, where the empeors worshiped heaven for good harvest. Drop by cultural silk factory. Enjoy dinner at Jinsong Qujude Roasted Duck Restaurant and then watch a fantastic Chinese Kung Fu Show. Today you will be able to see the World Heritage-Great Wall of China, Juyonguan section. 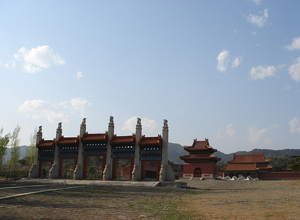 Drive back to downtown to visit the beautiful imperial garden Summer Palace, then drop by the cultural Pearl Factory. A Hutong rickshaw trip leads you to where old Beijingers lived, passing through the narrow alleys and lines of courtyard houses. After breakfast, heading to Eastern Qing Mausoleums, the largest, most complete, and best preserved imperial mausoleum complex in China. After chinese lunch, transfer back to hotel.